Both of us love cheesecake; in our opinion, it’s one of the best desserts ever- a buttery graham cracker crust, a smooth, creamy filling, and if we’re lucky, a strawberry or cherry sauce on top. However, we have only made it once because it’s just a little bit unhealthy and requires a lot of ingredients. 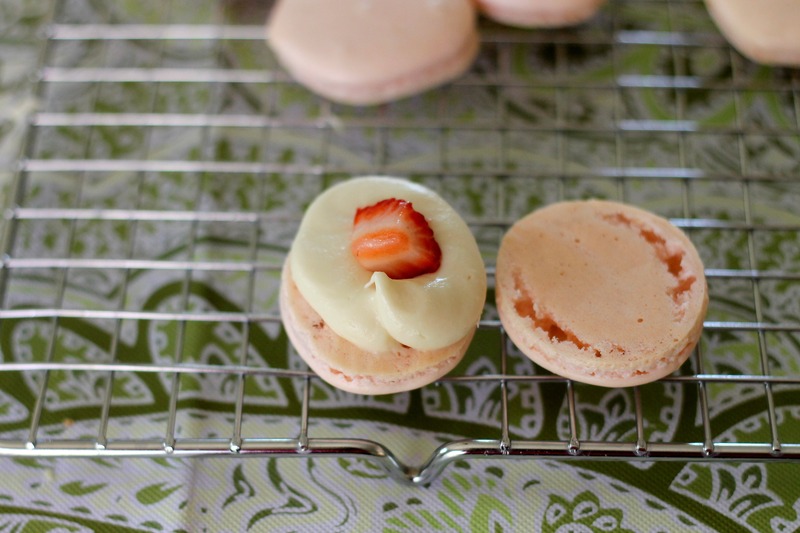 So, the other day, we came up with the idea of strawberry cheesecake macarons to use up cream cheese, strawberries, and almond flour that we had sitting in the fridge. The first tray of these macarons wasn’t so pretty. To give the shells a graham cracker crust flavor, we had sprinkled the top with graham cracker crumbs before baking. 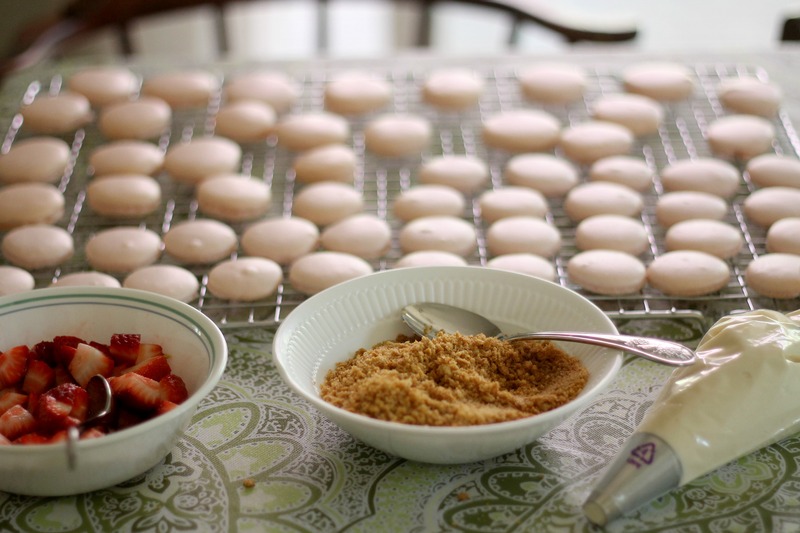 Whether it was because of the graham cracker crumbs, oven temperature, or undermixing, those macaron shells puffed and deflated. Yikes! However, we gave the macaron batter another stir and tried again, without the crumbs on top. They came out looking perfect! We filled the pretty pink shells with a swirl of cream cheese frosting and a chunk of fresh strawberry. Definitely not a bad combination! Celine baked a small tray of graham cracker crust. We broke up the crust and rolled the edges of the macarons in the crumbs. Voilà- the perfect strawberry cheesecake macarons. We’re not kidding when we say that these are quite possibly one of the best desserts we’ve made for both presentation and taste. They also satisfy cheesecake cravings. 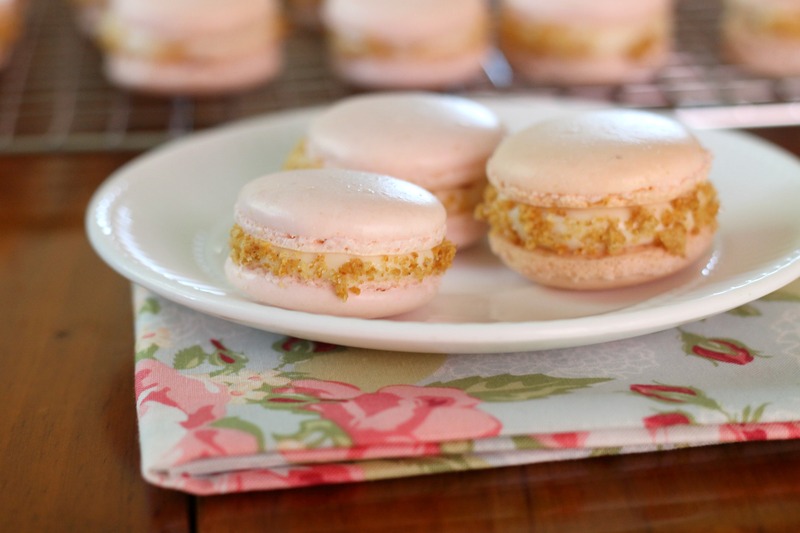 Macarons may take a little while to make, but they are definitely worth the effort. 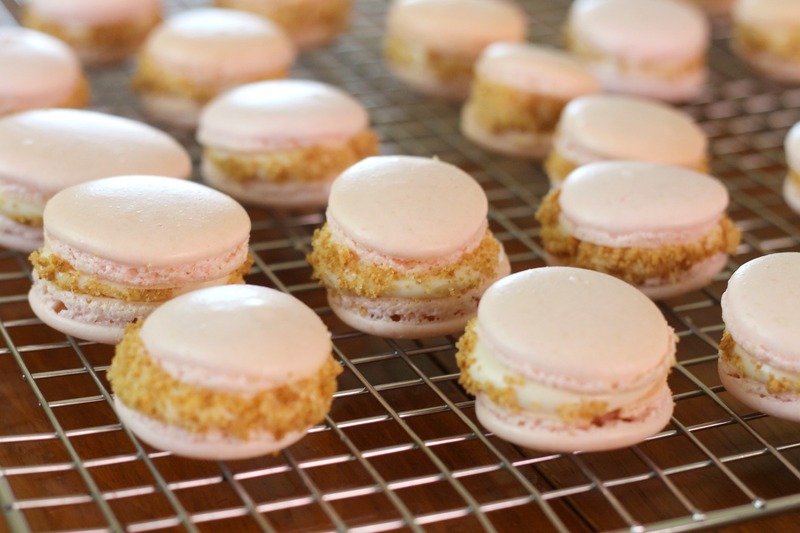 If you’re nervous about making macarons, take a look at our plain macaron post for some pictures. Melt the 2 tablespoons of butter in a small saucepan. Crush the graham crackers in a large ziploc bag or food processor. In a small baking dish (we used a pie plate), mix together the melted butter, 1 tablespoon of the sugar, and the graham cracker crumbs. Press down gently and bake at 350 degrees for about 7-8 minutes, or until they begin to brown. Stir it around and set aside. Wasth the strawberries, remove the stems, and cut into small chunks. Toss with 1 tablespoon of the sugar and let them set for about 20 minutes for them to release some juice. Set aside. Beat the cream cheese and 5 tablespoons of butter on medium-high speed for 2-3 minutes, or until light and fluffy. Add the vanilla. Slowly beat in the powdered sugar until smooth. Fit a piping bag with a large round tip and fill it with frosting. 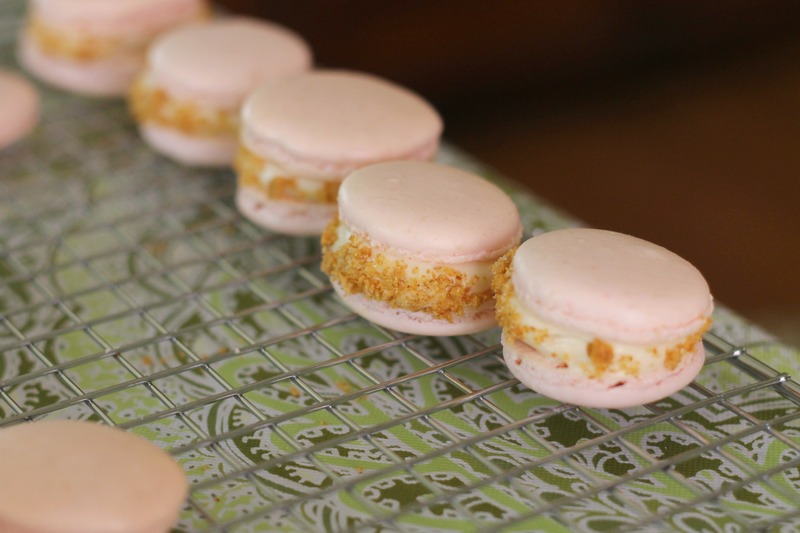 Pair the macaron shells by size, and pipe a small swirl of frosting on about half of them. Place a strawberry chunk in the center. Top with another shells and press down gently. Roll the edges in the graham cracker crust crumbs. We recommend eating them the day you make them, but you can store them in the fridge for a couple hours. Enjoy! These look gorgeous. What a great idea! Thank you! These are definitely one of our favorites :).